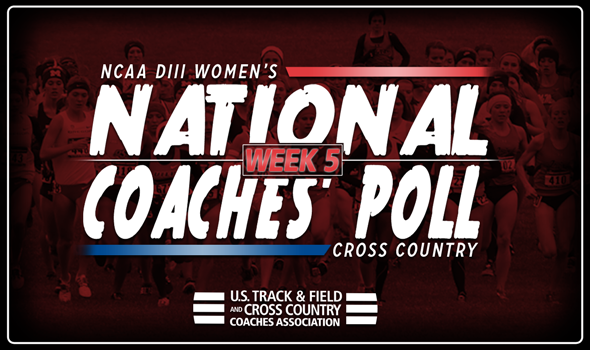 NEW ORLEANS – If teams aren’t racing, the NCAA Division III Women’s Cross Country National Coaches’ Poll isn’t changing. That’s what happened from Week 4 to Week 5 as a slow week limited movement in the most recent poll released Wednesday by the U.S. Track & Field and Cross Country Coaches Association (USTFCCCA). Very little changed from No. 1 to No. 21 outside of Bates falling out of a 13th-place tie with UW-La Crosse. Everything is similar from No. 1 to No. 12 and No. 15 to No. 21. The first true blip to the index came at No. 22, where Wheaton (Ill.) vaulted two spots from No. 24. The Thunder captured the team title at the UW-Parkside Lucian Rose Invitational this past weekend thanks to a strong effort by its scoring lineup. All five of Wheaton (Ill.)’s top-5 runners finished in the top-10, led by Hannah Roeske’s runner-up billing. Further down, Trinity (Texas) also jumped two spots. The Tigers went from No. 33 to No. 31 after finishing third among non-NCAA Division II programs at the Incarnate Word Invitational. Trinity (Texas) put four runners in the top-20 and scored 76 points. Business is about to pick up in NCAA Division III Cross Country, though, as we’re just about one month away from NCAAs. This year the NCAA DIII Cross Country Championships will take place on November 18 in Elsah, Illinois.